Just 2 pieces to swap? Hmm! Impossible!!! 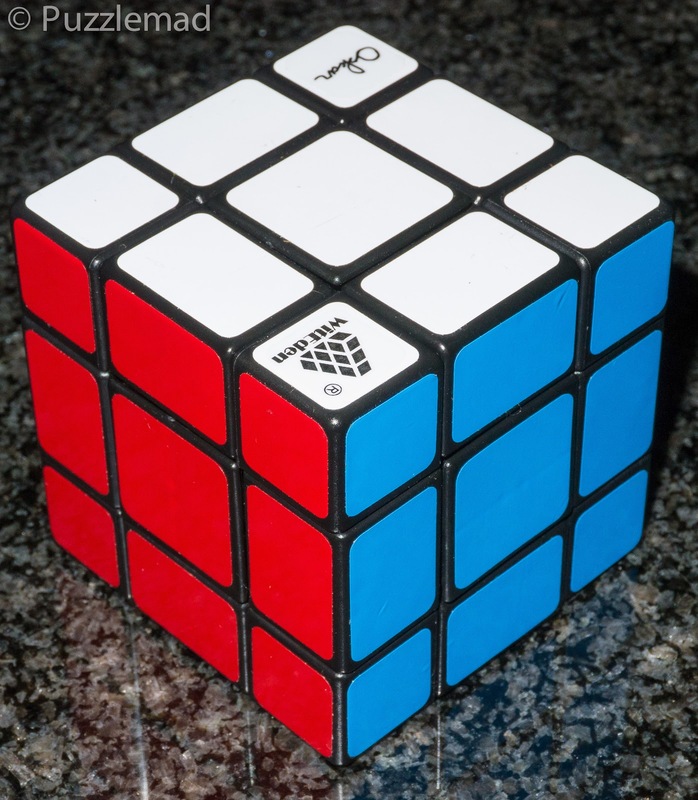 2 weeks ago I showed you all the fantastic 10x10x10 cube that I got from Cubezz.com and used it as a beginning of an introduction to explain my approach to parities. The parities I discussed were the ones that every beginner to twisty puzzles hates because they seem to be so inexplicable and require such complex solutions. I recall that when I first started on my twisty path, I avoided the even order cubes like the plague because of these parities. But ultimately an understanding that the problem was caused by the reduction technique has given me enough knowledge to be able to work out how to beat them. In fact I know that by avoiding this sort of reduction can prevent these parities completely! Initially I thought that solving in a layer by layer fashion would avoid the problem but unfortunately all it does is move the parities to the very last layer. 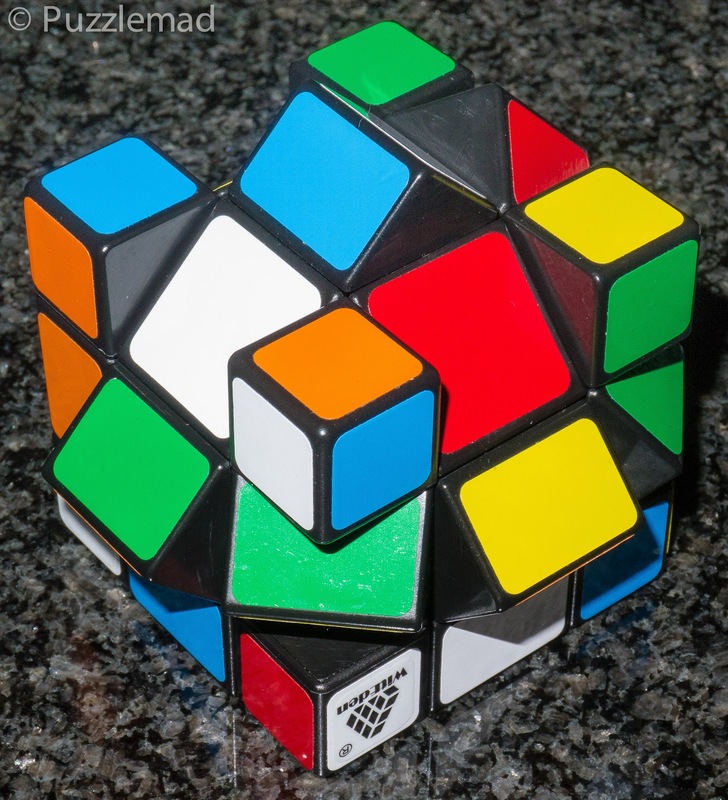 Even though that does not solve the problem you should all try it - take your 4x4 up to 6x6 (or larger) and solve it layer by layer. It is a really fun challenge! The final floppy parities can be VERY tough to resolve. One way to prevent the parity situation is to perform an edges last solution - my friends Derek Bosch and Andy Chillingworth have convinced me to try this and it really is a fun thing to do and there are absolutely no awful algorithms to learn! Give it a go! 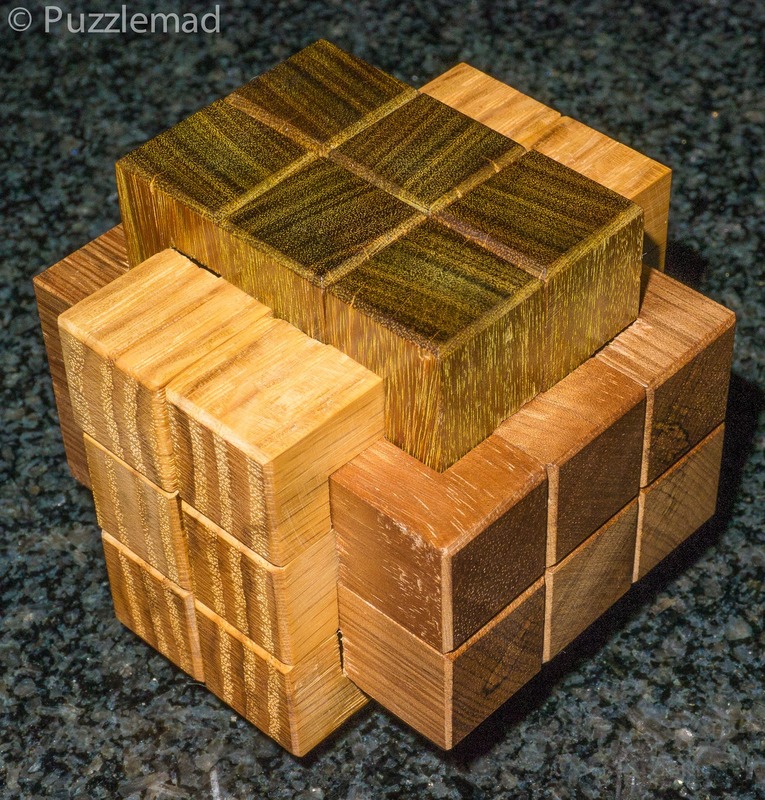 My first approach was to reduce the 4x4 to a 2x2 and solve that way. For the 4x4 this was a fantastic challenge (watch SuperAntonioVivaldi go through it here). 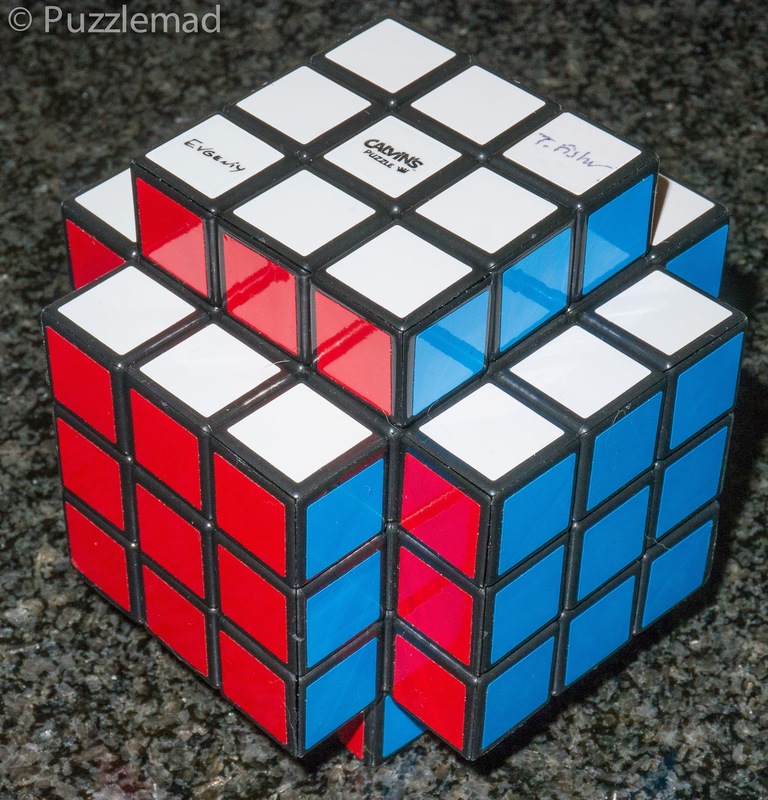 Recently he has posted another series of videos showing that it can be done with a 6x6 cube too! 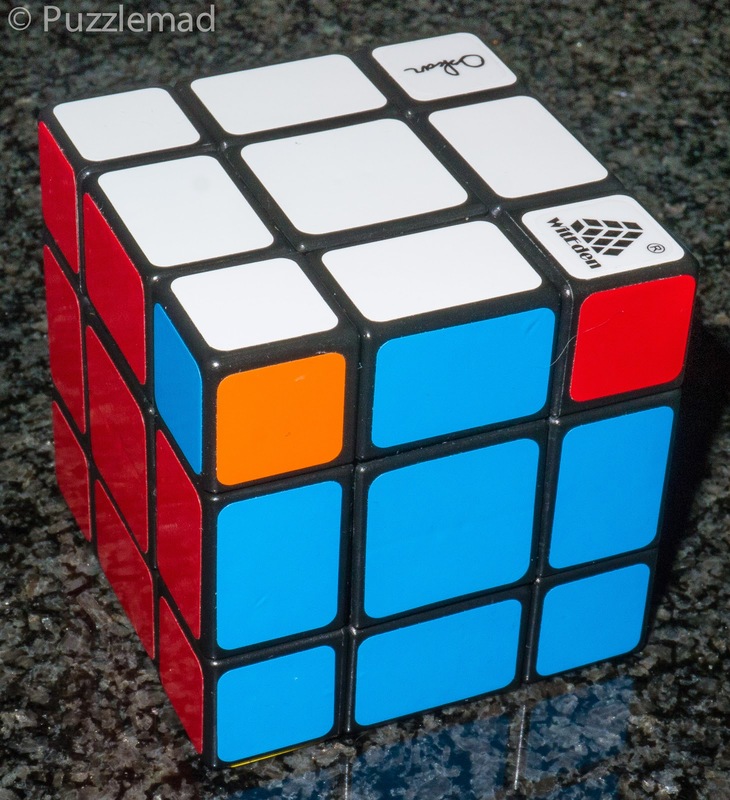 I recently got given a 6x6 cube by a Dutch friend (KattenVrienden on Twisty Puzzles) so I will be attempting this myself very soon. So having explained parity - there is nothing left to discuss? I'm afraid not! The parity so far is that caused by the reduction technique. There is another sort of parity which we see on simpler puzzles including the Void cube (a 3x3 with no centres) and also on various other shape mods of the 3x3. This parity was explained to me (again by the amazing SuperAntonioVivaldi) as the "parity of false equivocation". This sounds horrendous but, again, it is not! It is just a simple way to understand where the misplacement arises and from then it is a "simple thing to fix it". 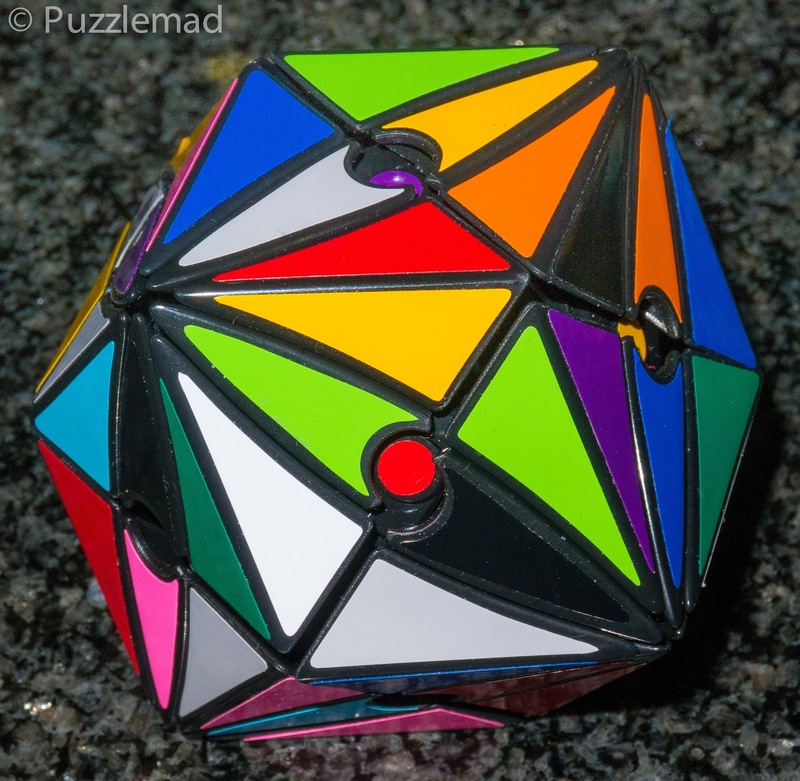 The puzzle at the top of the post is another fascinating cube that I also received from cubez.com - it is a new puzzle made by Moyu and is called the Evil eye (closed/version I) - like most twisty puzzles it is not expensive and Cubez do it even cheaper than anywhere else at $16.50. The both versions are pictured below. Version II is the "open eye" one and has little holes that reveal colours inside. Cross cube - just a 3x3 with extensions! Each apex of the Evil Eye is equivalent to an extension seen on the cross cube (the centre piece is hidden). Solving the Cross cube is actually a fairly simple thing - it is no more than solving the centres only of a 5x5 with no edges or corners! In the cross cube there can be no parity. So if that is so easy and they are functionally the same then how does the parity come about? Looking at the top photo you can see that the centre petals are all one colour (unlike the cross cube above where the centre edges have 2) - the green petals look identical but functionally they are not. 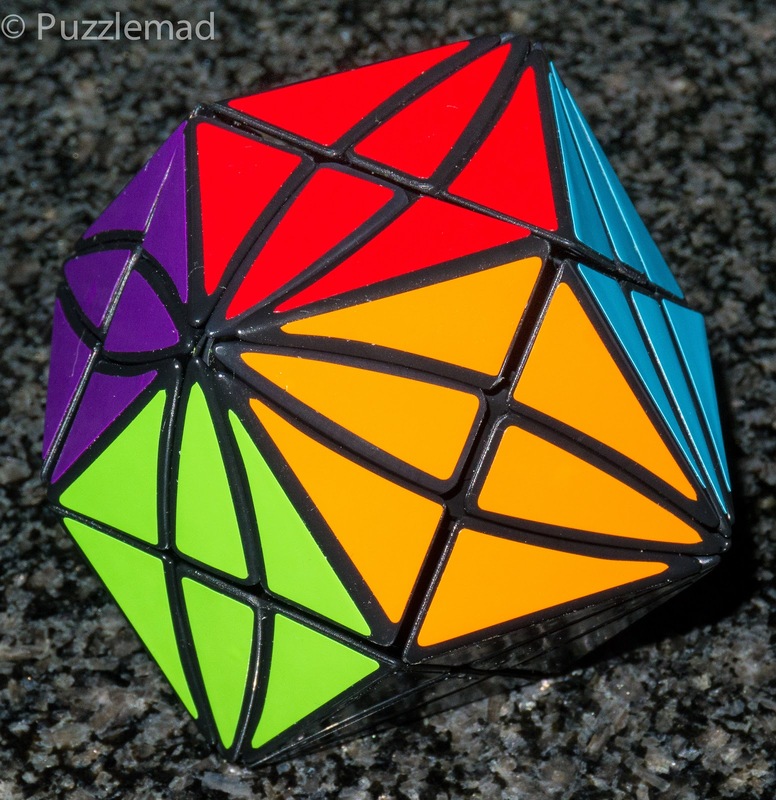 The "Law of the Cube" says that it is not possible to have just 2 pieces requiring a swap and it is true I have falsely equivocated the petals and if I need to swap them over too then that will be 4 pieces to swap - perfectly allowable. Now how you do that swap is another thing entirely! It took me a little experimentation and a very simple basic algorithm after some set-up moves and it was done! So here we have a very attractive pair of puzzles which are very similar to a classic design but add something very interesting. Just a 3x3 - no parities here! Wrong!!! 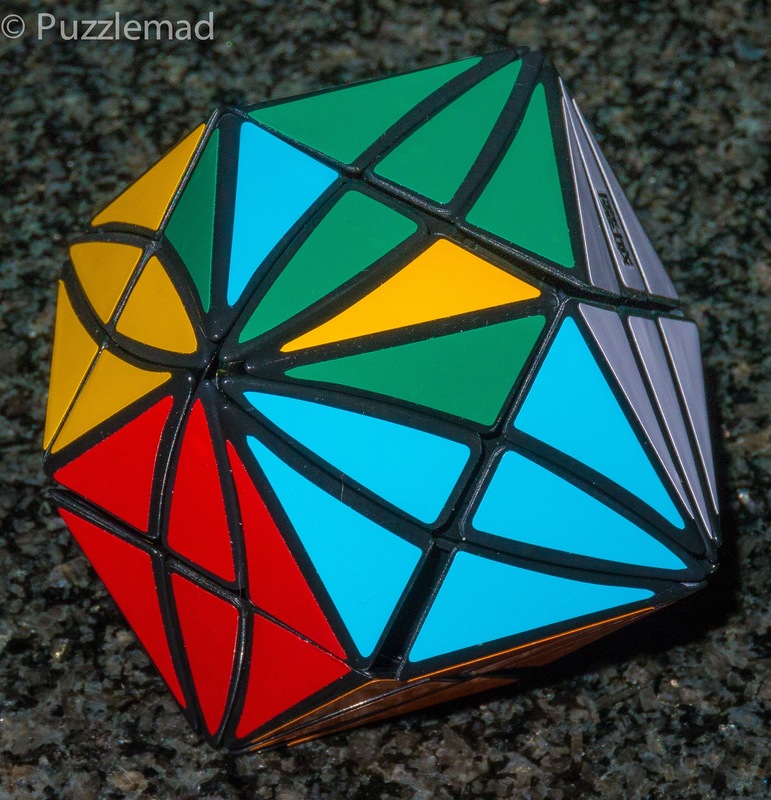 It looks like an oddly proportioned 3x3 and the reason for that is that Oskar has designed it to allow 45º turns of the centre slices so that the centres and edges can all be intermingled! Now when you scramble that you are going to have the non puzzler running for the hills! Help required? No - it's easy! Just 2 pieces to swap again? NO! In this pic just 2 corners need to swap or it can be made so that just 2 edges need to swap. Again, according to the law of the cube an impossible situation! But here we need to think about where the false equivocation might be - if it cannot be in the pieces which are all unique then it must be somewhere else! It is rather hard to imagine but the equatorial slots are all interchangeable - every equatorial edge is where a centre should be and vice versa. So to fix this (in fact to produce the photo) you need to work out how to take each edge out and put it a quarter turn further around and every corner the same! Again, we have a false equivocation but a different sort. From this you can see that whenever you have an apparently impossible situation in a twisty puzzle it is important to think of several possibilities - has the bigger puzzle been reduced to a smaller one in such a conformation that the smaller one cannot reach or are there pieces or positions that are interchangeable and you haven't realised it? Once you understand these basic rules, you are well on your way to mastery of many many twisty puzzles. Come on and join me in the fun - you know that you want to!!! 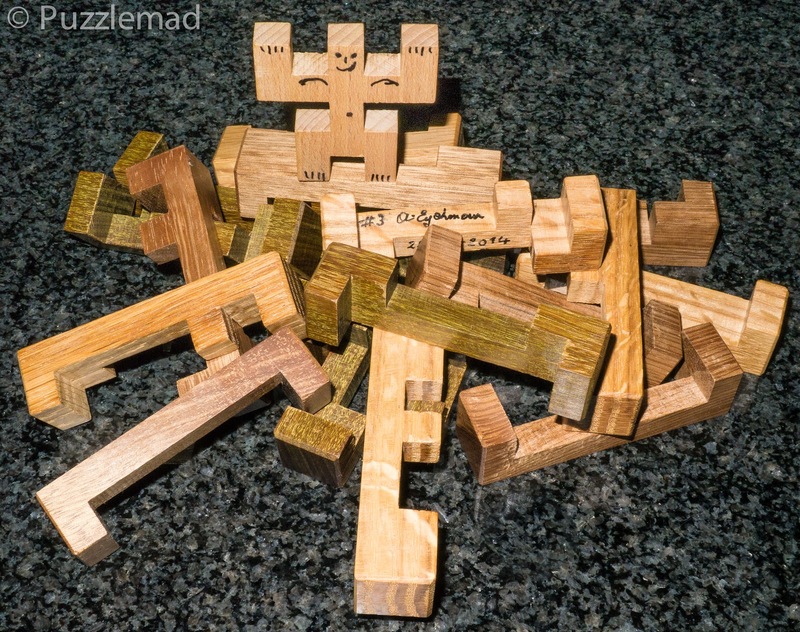 Last week I mentioned how I thought that I had lost my puzzling Mojo! Not only had I failed to solve the Euro puzzle but I was also struggling with the latest delight from my friend Shane. Well at last I can tell you that I have finally managed to get it open! It took a lot of help from Shane but I did it. It is an absolutely tremendous design and beautifully made! It has 2 different mechanisms holding it shut and one is of a type that I have NEVER seen before. Thank you so much Shane I am really grateful for the opportunity to sample your designs. 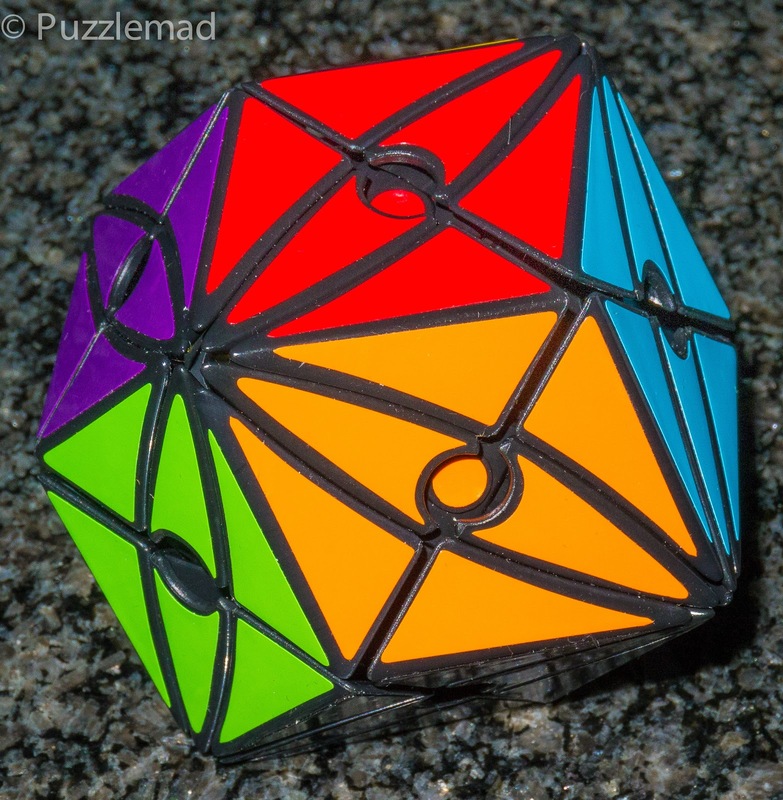 Just to reinforce how rubbish a puzzler I am, the "Puzzle Blogfather", Allard received his copy and managed to get it open in just 1/2 hour with NO clues whatsoever! I am soooo ashamed! Maybe it is time to hang up my puzzling hat? At last! 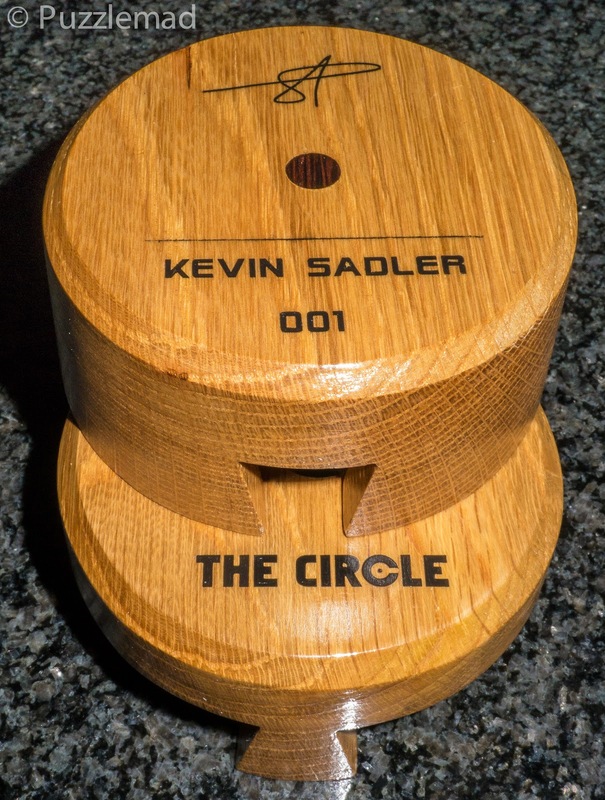 The Circle is open! Can I save the gorilla? Gorilla on top of the pile! Don't feel so bad mate! Shane assures me your tolerances were a lot finer so it would have been harder to solve!